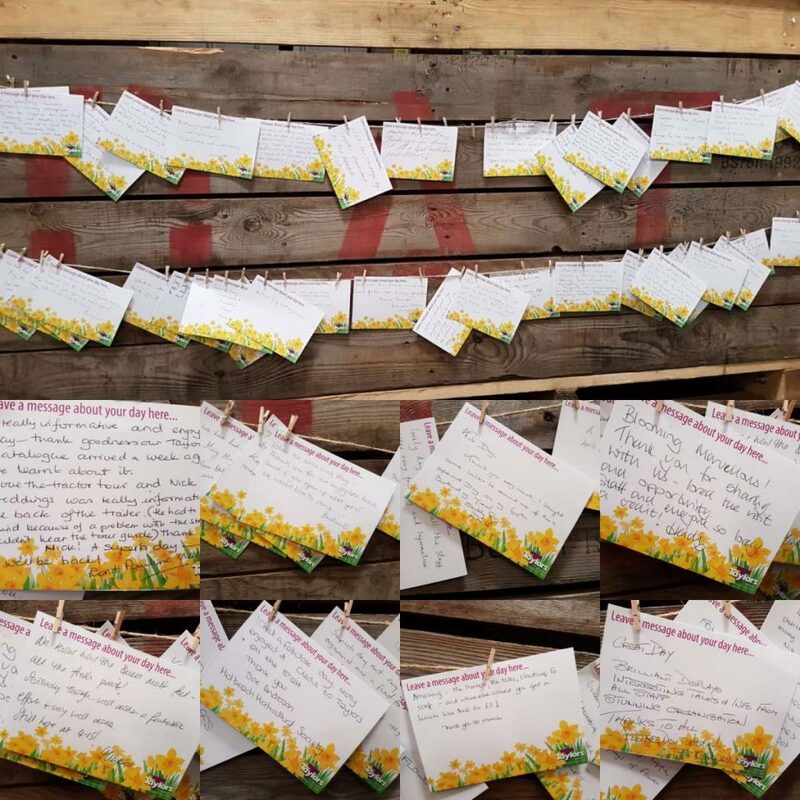 To celebrate our centenary, we held a “Daffodil Day” on 10th April 2019. 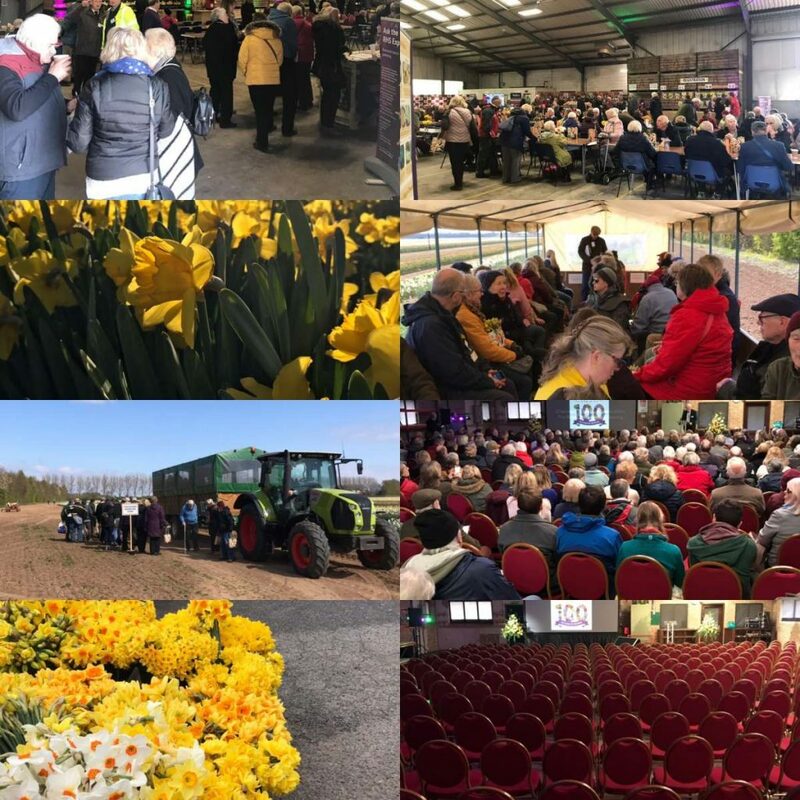 Over 400 visitors took the opportunity to walk our daffodil fields and enjoy informative talks from bulb experts. Just wanted to say how much we enjoyed our visit today, the daffodils were beautiful. We thought that a lot of time and effort must have gone into organising the day and it went splendidly. Our compliments to all your helpful and friendly staff too. You will have to have another day sometime……. Many thanks for a good day out and for even arranging good weather. We’ve just returned from our visit to Taylor’s – well, what a wonderful day! Please pass on our appreciation to all of your team and wish the Taylors continued success for the future. 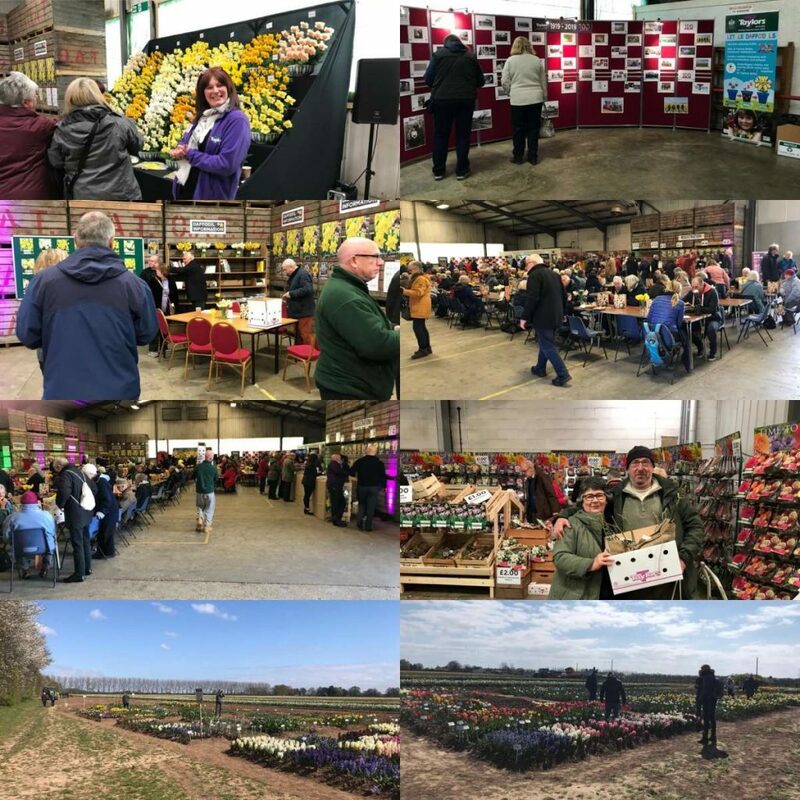 Many thanks for a terrific day.We thoroughly enjoyed the trip round the fields, the lunch was delicious, the staff knowledgeable and very friendly, and prices of the sales items not to be ignored, and the company is to be congratulated on organising a great day. Just wanted to drop you and the team a line to say Thank You so much for opening your doors today to share the experience with people. We had a lovely day, learnt an awful lot about the humble daff, but mostly were struck by just how bloomin’ lovely all the team were. From arrival in the car park through to the tour, refreshments and any questions everyone was faultlessly cheery and polite. Thanks to Johnny Senior telling us about this at Woodhall Spa gardening club back in January – so glad to have been able to come along. Best wishes to everyone and I shall look forward to planting the bulbs purchased and remembering the day as they flourish. Having just arrived back from our day with you, both my wife and myself would like to congratulate both the internal Taylors staff and all the external contributors that made this a wonderful experience. We found the speakers very informative, the staff very friendly and the organisation impeccable. Thank you very much for a joyous day. Everyone was very welcoming and helpful and really seemed to love being there. Thank you and here’s to the next 100! Thank you so much for such an amazing day. 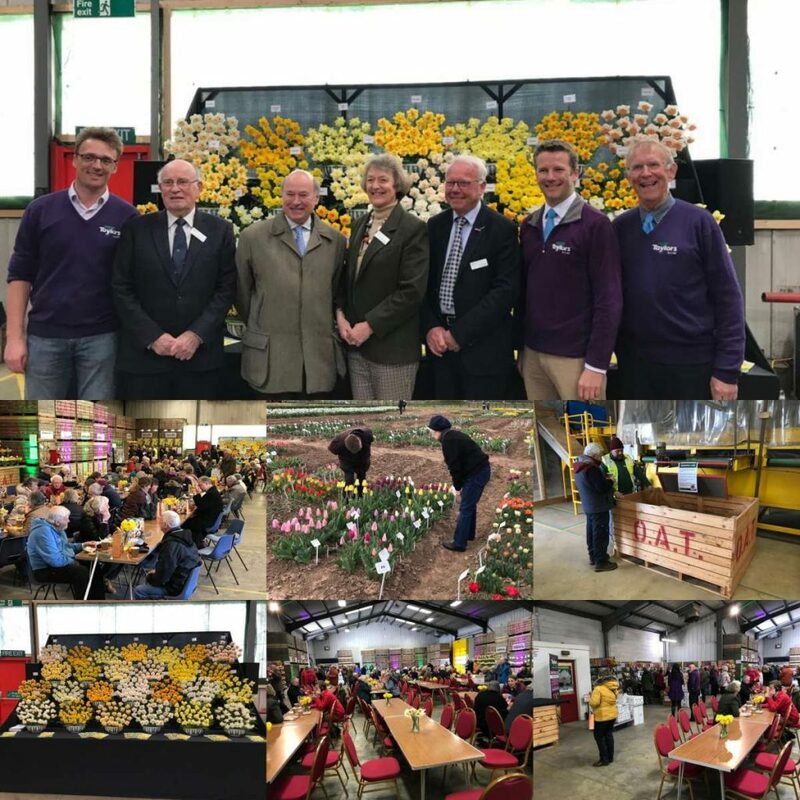 It was absolutely fascinating to see how Taylors has evolved in 100 years, all the machinery involved, visit the fields, hear the speakers and of course buy some bulbs and plants. I had a really wonderful time and your staff were all so friendly and helpful. The organisation of such a massive event must have caused a few headaches, but it was an amazing success. Thank you all so much once again. 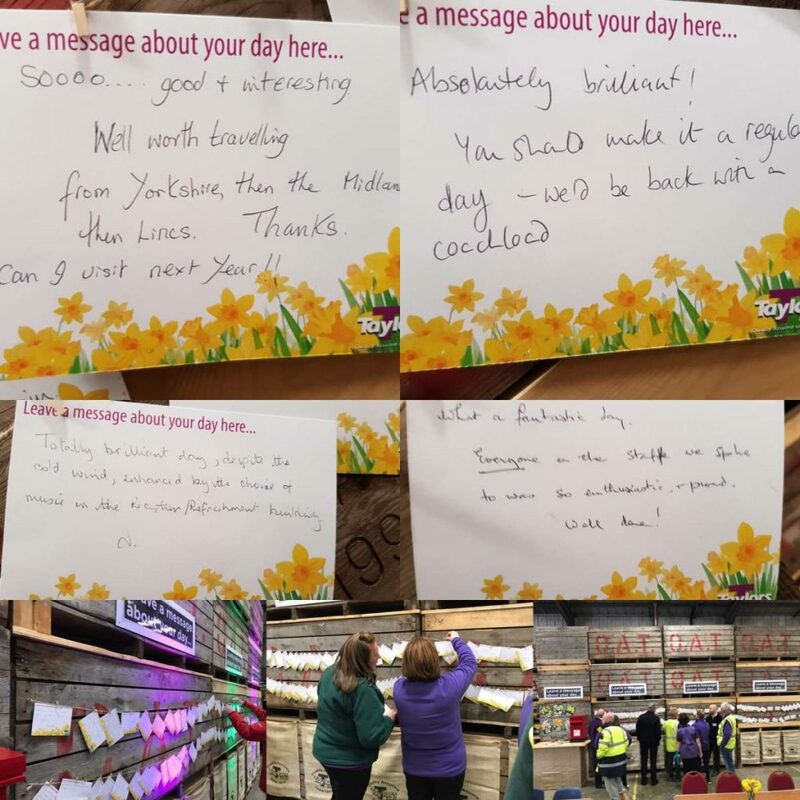 We write to say a huge “thank you” to Taylor’s Bulbs for hosting such a marvelous day yesterday to celebrate both your 100th anniversary and the beautiful daffodil. We had a really great time and cannot overstate the enjoyment we took from our day with you. Every aspect of the day was well managed (without being overly officious) right from the initial greeting and car parking through to the final cheerful farewell from the car park attendants. The registration process, the refreshments, the informative displays and the variety (and price !) of bulbs, tubers and plants for sale was wonderful and was but a precursor of events to come. The speakers, whilst quite different in style, were both very informative and entertaining and the opportunity to visit the different parts of the business to understand the processes involved was fantastic. A walk around the daffodil fields and the tractor ride was also a joy. Without exception the staff were a credit to Taylor’s Bulbs. Their energy and enthusiasm for their work, and their obvious commitment to their Company, shone through from start to finish. They were so welcoming in each area and we had some lovely conversations and learnt such a great deal. We are still buzzing from the experience and cannot help but share it with our friends – and we will be doing a great deal of planting today ! 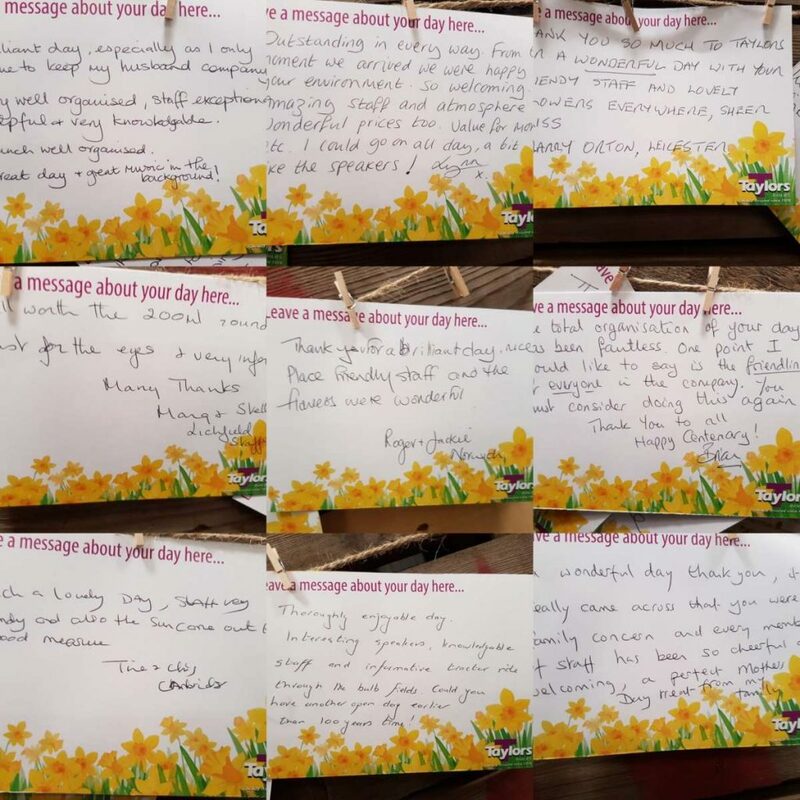 We have no doubt that making the day happen was challenging in many respects but, we very much hope that you all enjoyed the day as much as your guests – and that we do not have to wait for another 100 years to go by before you feel able to do something similar again ! Thanks to all the management and staff for the open day yesterday it was a very nice day and I appreciate the amount of hard work that had gone into organising everything and it was done perfectly.